Gracing my diet plans at the moment is the smoothie. I know you can buy them everywhere but making them at home gives you control over when exactly goes in, plus they are super easy! 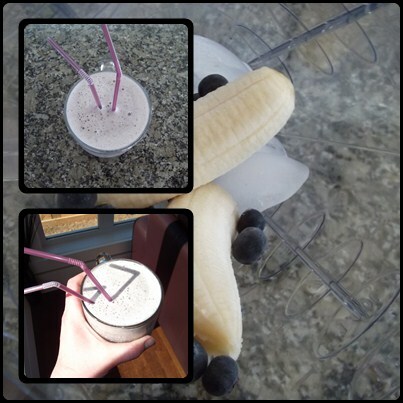 To my blender I add a few ice cubes, a banana, a few frozen blueberries and some skimmed milk. I cannot give exact quantities as I don't use them- this is the chuck it in and see method. Lid on, whizz and see if it's consistency is right- too thick, just add a little more milk! Decant into a glass, add straw and enjoy!